and release blockages in the chakras. Chakra is the Sanskrit word for wheel or disk, wheels of energy that flow throughout the body. 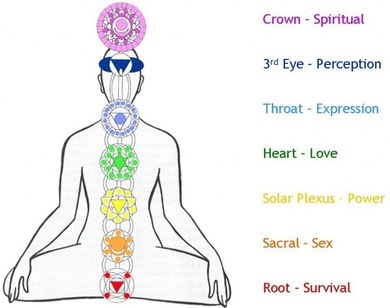 The seven main Chakras align the spine beginning at the base of the spine working up to through the crown of the head. This invisible energy is the vital life force that keeps us living a life of vibrant health. Each Chakra is associated with specific glands, organs, organ systems and mental, emotional & spiritual aspects.